Sunny winter mornings are far and few between in Milan, but thankfully Italy is abundant in orange citrus fruits this time of year, adding a little sunshine to our lives even on grey cloudy days. It’s no wonder I’ve been using them a lot lately, so look for a few orange recipes in the next few weeks. Speaking of sunshine, I want to take a minute to talk about the importance of it. Unless you live in a southern climate, chances are you’re not getting enough sun and therefore not enough vitamin D from the sun, during the winter months. I’ve recently taken interest in this topic and I have uncovered some things that I’d like to share with you. Please note, this information is general in nature and is not intended to replace medical advice. Vitamin D, known as the sunshine vitamin is produced by our skin when we get exposure to sunlight by reacting with the cholesterol in our bodies. Winter climates, northern climates with limited sunshine hours, smog, and clouds all reduce our ability to get enough sun and inhibits our body’s ability to produce the sunshine vitamin. There are two forms of Vitamin D, D2 and D3. D2, a plant based source of vitamin D is considered to be less bioavailable than D3 which is derived from the cholesterol in animal sources. Vitamin D3 is not produced by plants as they do not contain any cholesterol. As such, most people on a plant based diet, and specifically vegans, who don’t get enough exposure to the sun, may be lacking in Vitamin D. A simple blood test will show whether or not you have a deficiency and need to supplement. I haven’t been tested for vitamin D in a while, but the last time I was tested, I was borderline, so I’ve personally taken the habit of supplementing with 400 IU of vitamin D3 daily, especially in the winter months. While my brand claims to be “veg friendly”, I’m not quite sure how that is possible as all the research I’ve read about Vitamin D3 supplements indicate that they are derived from lanolin (sheep’s wool) or fish oil. Seems like sketchy marketing to me. I have however very recently come across a brand called Nordic Naturals, in my research for this post, made from Lichen which is derived from algae. It’s very interesting and while I don’t know much about this yet, it certainly is worth looking into. 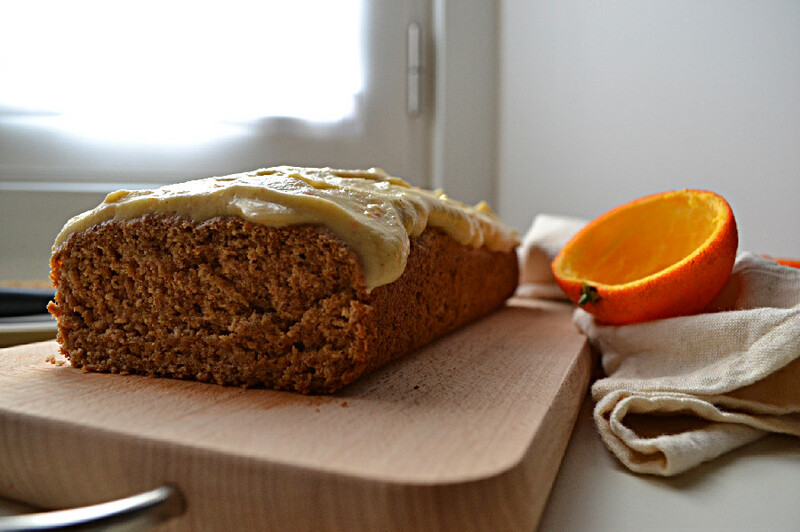 For now, let’s move on to the bright Orange Loaf Cake, to add some sunshine to your day. 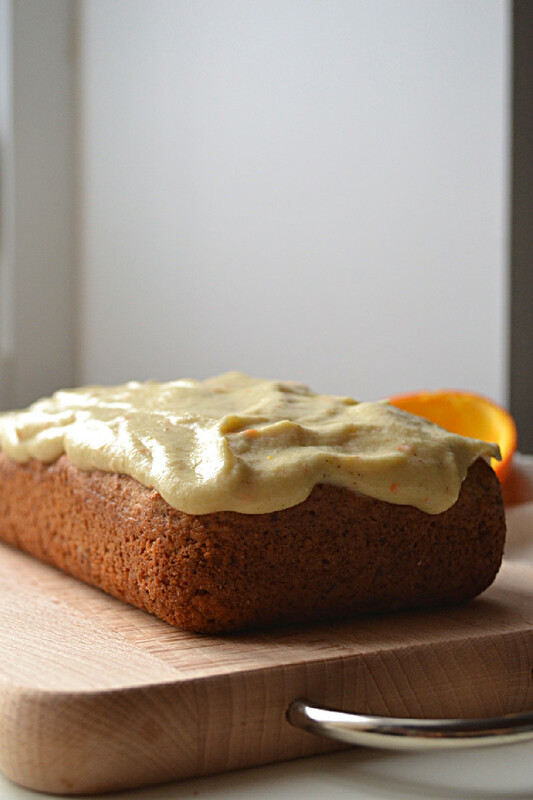 This Orange Spelt Loaf is vegan and refined sugar free and covered in bright Orange Coconut Cream Frosting adding sunshine to a dull winter day. Preheat oven to 180 C and place loaf pan inside to warm it up. Combine wet ingredients, except for apple cider vinegar, to a small bowl and whisk together. Add wet ingredients to dry ingredients and gently mix to combine really well. Don’t overwork the batter. Remove loaf pan from the oven and grease bottom and all sides with cold coconut oil. The oil will melt on contact. Fold apple cider vinegar into the batter and pour into the loaf pan. Bake on center rack for about 30 minutes, rotating the pan after about 20 minutes. The loaf cake will be ready when a toothpick inserted in the center comes out clean. Remove from the oven and let cool before removing it from the pan. Remove from pan and let cool completely before frosting (see recipe below). Place all ingredients, except for orange zest and orange juice, in a small pot and whisk together. Place pot over medium heat for about 20 minutes, whisking frequently, until the agar agar is well dissolved. Remove from heat, stir in orange zest and orange juice and transfer to n 11×17 pyrex dish. Let cool completely and then refrigerate for at least 1 hour or until the mixture has firmed up completely, slightly harder than jello. Remove from the refrigerator, scoop out the mixture into a food processor or blender and blend on high speed until completely smooth. Transfer to an airtight container and return it to the fridge to cool and set. The consistency at first is like a thick yogurt, but the longer you leave it in the fridge, the more it will set and become like a frosting. The frosting can be made 1 day ahead. Looks gorgeous Nissrine!! I have all the ingredients too! I may just try this today! Question, I tend to find fat-free baked goods having an odd stick-to-your-mouth texture…how is this texture on this because I don’t see any fat source added?? I may add a couple tablespoons of almond butter. It looks so good, I’m just so picky about baked goods made with all applesauce…do you notice a difference with this one? PS. You’re coming up as The Healthy Flavour…isn’t that your old blog? Well, as you know from Instagram, I made and loved it! I don’t have a lot of extra time on my hands due to my own blog and having a 3 year old, so I only make recipes I see that are easy and not too much time. This one was really fast to whip together and I loved the citrus flavor. I also love that it is fat-free! I made mine fat-free by skipping the coconut cream and making a simple orange glaze…1/4 cup powdered sugar, 1 tablespoon orange juice and 1/4 teaspoon vanilla powder. It was delish! Thank you Brandi for taking the time out of your busy schedule to make this. I’m so glad you enjoyed it. I love the trick you shared on Instagram to poke it with toothpicks after baking and squeezing extra Orange juice into it. Thanks so much for your feedback Susan. I’m so glad you enjoyed it. It looks like you used a larger loaf pan than I did. What size did you use? I used a 30cm loaf pan. It’s the standard size loaf pan here in Italy and I think it’s slightly longer and more narrow than the North American standard size loaf pan. Since it came out so well, I guess I might as well stick to the pan size that I used. I made it twice. The first time, the power in town went out while it was in the oven and had 10 more minutes to go!! I did not know what to do. I left it in the oven for 20 minutes or so, and by flashlight (it was at night at pitch black in the house), I took it out and let it cool. Then, when it did, in the dark, I ate about 1/4 of the cake, it was so good (and so forgiving of the baking circumstances). As I had already started on the icing, before the lights went out, I finished the icing when the lights came back on. But, LOL, as I said, I had already eaten 1/4 of the cake (which was delicious, even w/o icing). So, I froze the remaining cake, put the icing in the fridge, and the next day made a whole new cake to ice. I did not have any oranges left, so I used lemons, instead, for the cake (for the icing I had used oranges). It was still delicious, though I liked it better with the oranges.